You will earn 7,238 Reward Points. Earn 1 reward point for every 1 dollar spent. Easy installation, no drain line or water connections are required. Boilerless Pressureless Steam Cooker, Holding Cabinet and Rethermalizer. 6" (152mm) Skid Resistant Stainless Steel Adjustable Legs with Flanged Feet. Separate Power ON/OFF Control includes an Automatic Pre-Heat when power is turned "ON". 12 kW total output, with easy to remove 1 kW heating elements (9ea) cast into aluminum bocks. Programmable Preheat and Holding Cycle Temperature Controls with Compensating Thermostat. Electronic Low-Water Shut-Off Safety Indicator with audible alarm, High Temperature Safety Shut-Off and LED "Heat On" Indicator Light. 8 gauge stainless steel inner cooking compartment, 14 gauge stainless steel outer compartment with two piece compartment door for an airtight, leak-proof seal. Optional Voltages, 480 Volt (VOS2). URK Pan Rack Kit UniStands (P/N 111726). POSK Pull-Out Shelf Kit for UniStands (P/N 111724). 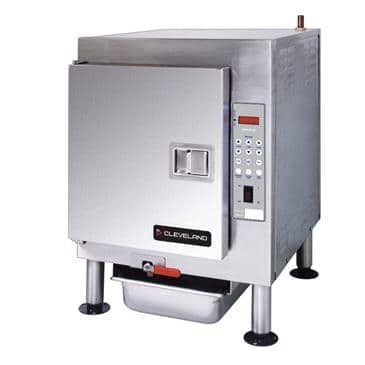 Cleveland SteamCub Plus™ , Model 1SCE, one compartment counter top steamer, holding cabinet and rethermalizer model number 1SCE. Electronic controls with three operating modes: constants steaming, steamhold and holding only. 12 kW, 208 volts, 3 phase. Audible low water and high temperature safety indicator. 8 gauge stainless steel inner cooking compartment, 14 gauge stainless steel outer compartment with two piece compartment door. The Cleveland Range 1SCE@2401EX (Express Ship) (1SCE208240112KWEX) SteamCub Plus? is your ticket to an efficient and organized kitchen. This item is 29 inches tall, 21.63 inches wide, and 24 inches deep. This appliance is Energy Star-certified.